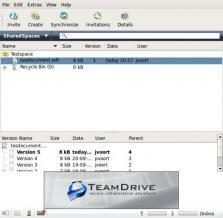 TeamDrive Portable is a handy and efficient piece of software that gives you the opportunity to keep the data on your various computers synchronized both on and offline. The application comes equipped with unparalleled 256-bit encryption from end to end to ensure that you never have to worry about the security of your data during transfers. Since everything is stored and synchronized through a cloud service, you will need to create an account when you first open the application but as soon as you’re done that the synchronization is virtually effortless. And since it’s a portable application, it won’t leave any traces on your Windows registry and you can easily put it on a USB stick so that you can take it with you anywhere. Regardless of whether you’d like to synchronize your home computers or you’d like to be able to access your work documents from home, TeamDrive Portable makes it happen. - Gives you the opportunity to synchronize the data of all your computers, regardless of whether they’re online or offline. - 256-bit end to end file encryption to ensure that all your files are secured during transfer. - Lets you create a new space on the cloud server or choose an existing folder in the file system and convert everything quickly and easily. - Automatically syncs everything for you as soon as something changes. - Makes it easy to create teams and share work with anyone that has a computer. - Lets you assign read/write privileges to users with ease. Free for personal use only. To use in a commercial environment and book extra storage, you’ll need to upgrade to the Pro version.